Constipated in the morning. Yesterday I gave him Lach 50M (experimenting with this potency), sip dosing twice from about 2 ounce of water. Also Candida Ablican 200c nosode - sip dosing too. I have diluted about 5 pillules of Candida ablican nos in a bottle of mineral water and let him sip every 1/2 hr for about 3 - 4 times - with closed observation. (Succussed 5 times before each sip). He has also taken OoO x1 and GSE x 1/2. 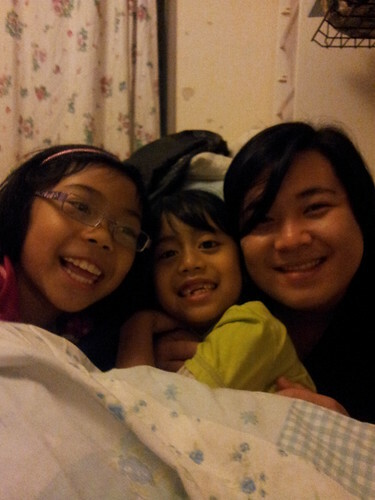 Culturelle x 3 at bed time. Garlic ear plugs during sleep. Ariezal came to visit yesterday evening before his bed time and Imaan adored him. Took pictures with lots of smiles and eye contacts. Hugging and lying on Ariezal's lap. He knows that Ariezal used to be his volunteer. Wonderful connections! Quite rare these days. Today he seems noticeably better. Much less shrieking and more connected. A bit of crashing knees on the floor in the morning though. Language increased as well. Still sip dosing of the remaining candida nos from yesterday. I am more convinced that the key to him is aggressive candida and bacterial control. Doing research about the different types of ear infections in humans, led me to conclude that Imaan has yeast ear infection. Probably bacterial too but more of yeast. The ear has this white foamy and cottony looking stuff in it matched the description of yeast in human ear in an article I got from Dr Google. Also now is his ACC round weekend plus we are doing CEASE clear as well. His body must be very tired with all this detox. Update - at 4pm today: loose motion, frothy. Yay! yeast is out. Better out than in. Still sipping candida ablican nos since morning. Sip dosing constitutional too (twice). Plus have upped the yeast killer - GSE (1/2 tab x2) and OoO (x1). CP1 probio x2. He looks tired and sleepy. Really tricky balancing his supps. Cannot wait to meet our muscle tester next weekend to check dosage.